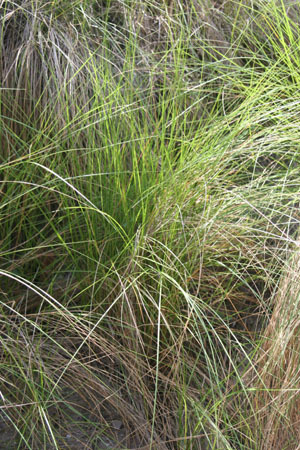 General Landscape Uses: Accent groundcover in coastal areas. Description: Medium herbaceous grass, first clumping then spreading from rhizomes. 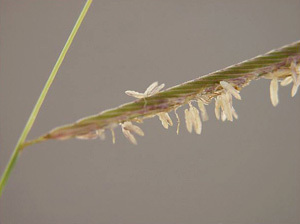 Dimensions: Typically 2-3 feet in height; to 4 feet when in flower. Ultimately spreading and forming large, open or dense patches. Range: Widespread in North America south to the Monroe County Keys; West Indies, Mexico and Central America. 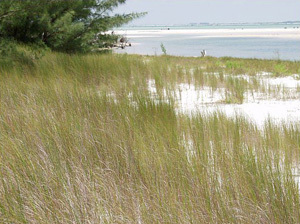 Habitats: Coastal marshes and beach dunes. Soils: Wet to moist, moderately well-drained to poorly-drained brackish or saline soils, with or without organic or humusy top layer. Flowering Season: Spring-fall; peak summer-fall.